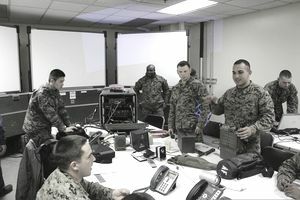 Ground intelligence officers are trained as the primary platoon commanders in division reconnaissance companies, infantry battalion scout/sniper platoons and other ground intelligence assignments. These assignments can include Battalion, Regiment and Division Staffs, Marine Logistics Groups and Intelligence Battalions. They serve as commanders of the reconnaissance companies within division reconnaissance battalions. The Military Occupational Specialty or MOS code is 0203. This is a Primary MOS or PMOS, an Unrestricted Line Officer ranging from Captain to 2nd Lieutenant. Ground intelligence officers effectively analyze gathered intelligence information and take action based on their conclusions. They can execute certain responsive actions based on approval by one or more levels of the U.S. military. They are responsible for the planning, deployment and tactical employment of ground reconnaissance units, and they are also responsible for the discipline and welfare of their unit's Marines. Ground intelligence officers also plan for operations in nuclear, biological, chemical defense and directed energy warfare environments. They are additionally responsible for their unit's communications capabilities, operational logistics, and maintenance. Their function within the military is similar to that of Army Rangers and Navy SEALs. MCO 3500.32, Intelligence Training and Readiness Manual, gives a complete listing of duties and tasks. Assignment as a primary MOS was once available only to male lieutenants because it is considered a ground combat position. This changed in 2013. The position is now open to female Marine officers provided they meet all the same standards and other requirements as males. A ground intelligence officer must be a U.S. citizen and be eligible for or already have a top secret security clearance and access to Sensitive Compartmented Information. SCI access is predicated upon a Single Scope Background Investigation or SSBI. Application for the SSBI must be made prior to attendance of the Ground Intelligence Officers Course at NMITC in Dam Neck, Virginia. A ground intelligence officer must complete the Basic Intelligence Officer course (BlOC) prior to being awarded the MOS. He must additionally complete the Infantry Officer Course (LaC), at the MCCDC in Quantico, Virginia, the Scout Sniper Platoon Commander's Course (SSPCC) at MCCDC in Quantico, Virginia, and the Ground Intelligence Officer's Course (GIOC) at ​Navy Marine Corps Intelligence Training Center (NMITC) in Dam Neck, Virginia. Officers assigned this MOS will retain it as an additional MOS following completion of the MAGTF Intelligence Officer Course and re-designation as a 0202 MAGTF Intelligence Officer. After training, the ground intelligence officer can serve as a Recon or Reconnaissance Marine. Indications and Warnings Course, Washington, DC. Ground intelligence officers may qualify for hazardous duty pay when their special skills, such as SCUBA or parachuting certification, are required in a mission, but not simply because they possess those skills. Related Marine occupational codes include intelligence research specialist 059.167-010 and intelligence specialist 059.267-014.